I've got a fun project today that uses strips from 2 liter bottles to make super awesome bangle bracelets. I used the 3/4" strips that were left over from when I made my Recycled Yarn Holders. You could just cut strips from a 2 liter bottle, if you didn't need another yarn holder (Who am I kidding?! Everyone needs another yarn holder!). 3/4" strips cut from a Sprite (or any other) 2 liter bottle - cut around the bottle, not top to bottom. Use your scissors to make sure that your strip of plastic has smooth edges. You don't have to get crazy and sand them, just make sure that there aren't any jagged edges that might scratch you. Trim the short ends of the plastic strip so that they're straight, if yours are cut wonky. Fasten off. Weave in ends. Being careful not to twist the cover, whipstitch the short ends together to make a ring. Place one cover around the outside of the plastic strip. Place the other cover into the center of the strip. There will probably be an inch or so of overlap on the ends of the plastic bottle strip. This is a really good thing. 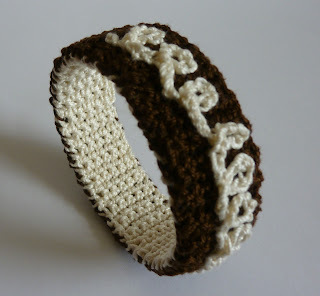 It will allow your bracelet to slightly stretch when you put it on and take it off. Whipstitch the sides of the cover together to fully encase the plastic. 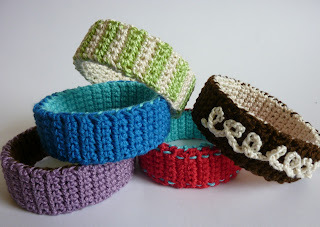 What I really like about these bracelets is that they're a great project for using up scraps from other yarn projects. Recycling at its best. And they're PRETTY!!!! I couldn't help myself, I had to make a bunch. In the interest of full disclosure, you might not be able to stop either. It's pretty addictive. But, they would make great gifts, and your niece and girlfriends are going to want a bunch when they see you wearing them!!! So maybe it's good that you're going to want to make a ton of them... LOL!!! This is super creative and adorable. I love it. Great way to recycle and less plastic goes into the land fills. Thanks for checking them out, Piper! I like that I didn't have to throw away the 'useless' strip leftover from the yarn holders! Hello Is itok to sell things I make from your patterns i credit you for the pattern. Celtic rings were cherished by the ancient Celts and they considered them one of the strongest symbols of marriage, or as a way to convey messages of never-ending love either between god and humanity or between man and woman. I have conjointly this connected web site. Celtic rings ar common items of jewellery not just for a people, however anyone World Health Organization craves for rings with distinctive styles. Celtic rings don't seem to be solely jam-packed with symbolism; they're steeped in history, traditional knowledge and mystery also.